Baseball 'Bot, Please Do My Dishes : Krulwich Wonders... It can't pitch, hit or run, but it can catch two baseballs barehanded — at the same time. Even Derek Jeter can't do that. But there are some things humans just do better than robots. Dave Mosher: A state-of-the-art, baseball-catching robot. DM: A robot that catches baseballs without a glove. And when I say balls, that's what I mean: this guy can catch two bare-handed — at the same time! Me: You don't need to catch two balls in baseball. 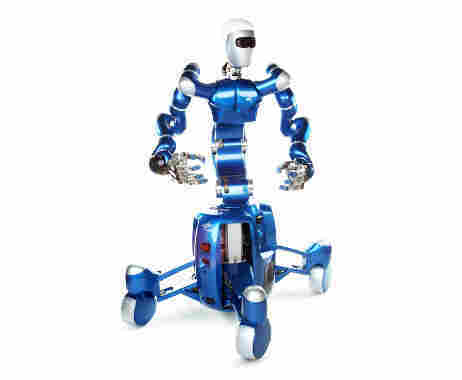 DM: They call this robot "Rollin Justin" because it can scoot around while constantly crunching complex equations to figure out where the balls are going. Me: And a brain, sort of? DM: ... and a brain that tells it how to go to the right spot, put its arm in the right place, intercept the ball and squeeze its fingers shut at the exact moment the ball makes contact. DM: Not really. It just looks smart. Justin's body is clogged with joints and motors and cameras and sensors and wheels and a power source and... Well, the truth is, there's not a lot of room for a brain. Me: So how does he catch all those balls? DM: Most of those balls, the video doesn't show it but he misses two out of 10 times. DM: Pretty impressive. Christoph Borst, who helped develop Justin's systems over the past ten years, says most of the 'bot's brain sits in a box somewhere at the German Aerospace Center. When you toss a ball in his direction, Justin records the trajectory, beams it to wireless router, and onto a computer with 16 computer processors (the dual-core kind, so 32 total cores); the computer figures out what Justin should do and zaps instructions back to the robot, all in 80 milliseconds. In the blink of an eye. And I don't mean that figuratively — literally, as quickly as your eye blinks. Me: So what would happen if you plopped this guy on a real baseball field? Could it play with humans? DM: Maybe, but it's fragile. Anything stronger than an underhanded toss can bust its little fingers. It also can't pitch, run very far, or pick up a ground ball to execute a triple play. Me: So there's not much Jeter in Justin? DM: Nah, humans — let's just say "we" here — we're better at this stuff because our brains use a funny thing called heuristics. That's mumbo-jumbo for seeing patterns. We're the ultimate pattern-finders. Brains are plastic, meaning they reprogram with experience — to the point that we don't have to think about catching or hitting a ball. We just see it coming and we just ... execute. 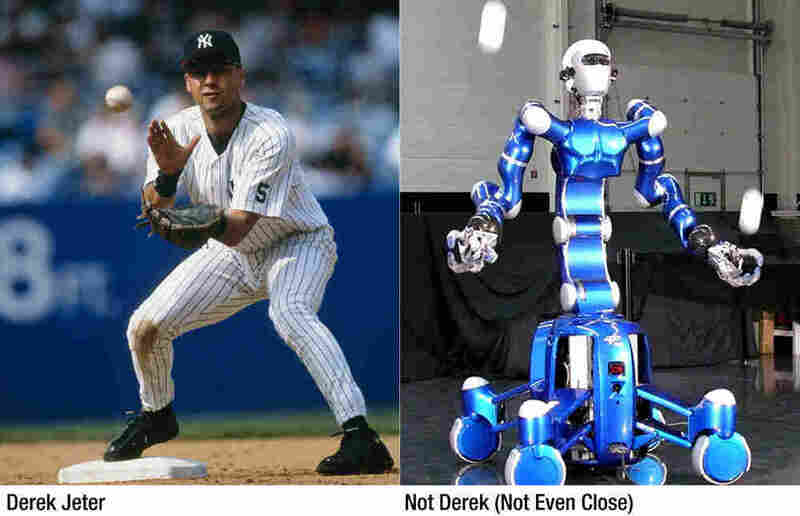 Me: So you're saying baseball's too hard for a robot? DM: No, I think one day there will be robot ball players. And maybe in a pickle, they'll even duke it out on the field like gladiators (hey, I played Base Wars on Nintendo as a kid). But you know what's really, really going to be hard? DM: Getting robots to cook. DM: ...and here's the thing: Christoph, who works with Rollin Justin, says the hardest part comes after the meal. DM: Meaning, washing dishes. It will take years to get a robot to do that. DM: You need to grab the dish just right, you need to account for the slipperiness, you need to wet the sponge, get it soapy, scrub till it's clean and — what's clean? What does that look like and feel like? Then there's rinsing and drying. And putting them in the right place. This is tough stuff for robots. Me: So that's why we will see robots on second base before we see robots in the kitchen? DM: Exactly. You know somebody's going to keep trying, so that's my prophecy: Robo-dishwashers before robo-Jeters. Dave Mosher is a freelance science reporter who calls himself a "web nerd." He's written extensively about space and deep sea exploration on his blog, Cosmopolitanaut. Editor's Note: A previous version of this post suggested that Christoph Borst, who works with robot hands, created Rollin' Justin and taught him to catch. In fact, many people were involved with the invention and development of the robot, including Berthold Baeuml, who heads up the ball-catching project. Robert Krulwich demystifies the dense and difficult to bring you the wonder of science. Want to get in touch with Team Krulwich? Drop us a note via our handy contact form. Get Radiolab delivered fresh every other week.